CTT Communications has a heritage in sports programming that spans high school to college and professional games. Craig Wallin is an announcer who's likeable but also knowledgeable about the sports he covers. 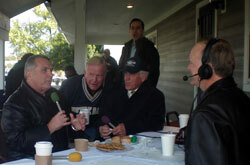 Here he is talking with the real Rudy, Notre Dame’s Rudy Ruettiger before a game one Saturday broadcasting on WSBT Radio. MORE TO COME..... THIS SITE IS STILL UNDER CONSTRUCTION!